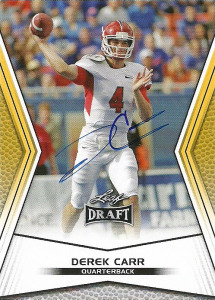 Derek Carr had an impressive career at Fresno State playing for the Bulldogs. He shattered many of the records previously held by his brother David at his Alma Mater. In his Senior season, Derek led the nation in pass attempts (454), yards (5,083) , and touchdowns (50), and finished 8th in Heisman voting. He posted decent numbers at the combine, and was drafted near the top of the 2nd round of the 2013 NFL draft. Considered one of the top quarterbacks of the NFL draft, Derek was rumored to be on many team’s shortlists, and with the Houston Texans dealing with their sudden implosion at quarterback with Matt Schaub and a new coach, that the Texans would possibly take a flyer on him. I didn’t believe that for a second. Everybody knew in the Texans’ organization that if they took Derek Carr, there’d be riots in the streets with loinclothed savages turning over vehicles. You see Derek’s older brother David, was the Texans’ first quarterback ever, and he got a bad wrap as a starter in Houston taking all those sacks and dealing with that wonky delivery. The Raiders thankfully took Carr near the top of round 2. He had a pretty solid season for the franchise going 348/599 for 3,270 yards, 21 TDs to 12 picks. Derek won 3 games his rookie year. His best game came against the Chargers in week 6 when he threw for 282 yards and 4 TDs. Frankly based on the lack of talent that was around him he did pretty well and all signs point to up for Derek as the Raiders continue to build an offensive nucleus around him.